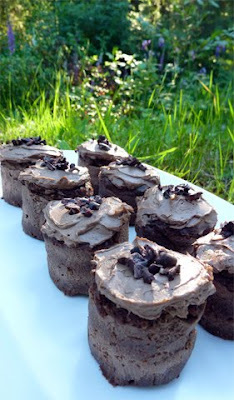 The Sunny Raw Kitchen: Raw Celebration: Triple Layer Chocolate Cake and More! 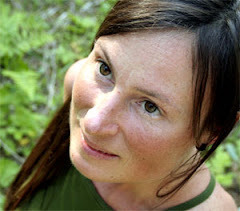 Raw Celebration: Triple Layer Chocolate Cake and More! As I mentioned in a previous post, we celebrated two occasions earlier this month: I turned 39 years young and, I have been walking alongside Don for 10 years now. Wow, what an amazing journey Life is turning out to be! On my birthday, we started the meal off with a recipe that another Lisa - one of our hosts in Washington - shared with me. I was glad to finally have an opportunity to try the smoked sea salt I had bought in the States. It gave the soup a delightful subtle flavor. I did cut down on the chili called for as we have a pretty low tolerance to heat. It was still a wee bit too spicy for us but still very delicious. Blend all ingredients in your blender, combine until you reach a creamy consistency. If you want to reduce the heat, use less chili flakes. ~ I used 1 cup red bell pepper and only 1 cup dried tomatoes. ~ I used 1/2 avocado instead of olive oil. ~ I used less chili as we don't like too spicy. 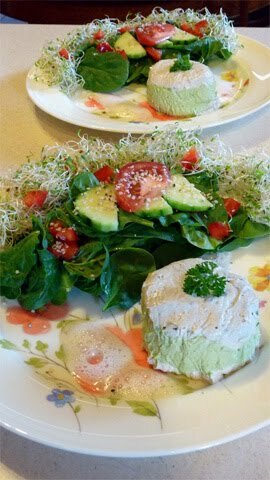 I'd only used Irish moss in a savory dish once before and was itching to give it another try. The texture was interesting although I was expecting something much lighter, as Irish moss gives to desserts such a light/melt-in-your-mouth quality. The flan was accompanied by a Brazil Nut Foam which didn't turn out quite as foamy as it should. I thought that the foam's hint of cardamom blended very nicely with the flan's milder flavors. I halved the recipe and somehow didn't have enough of the white cream to make several layers so I settled for one thick green stripe flanked by two thin white ones. 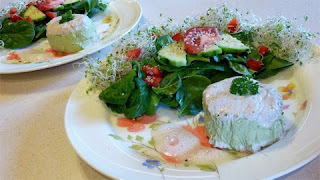 I served the dish with a simple spinach salad with slices of cucumber and tomato and homegrown sprouts. Sure made for a lovely presentation! I wasn't so out of the loop though that I didn't know that Matthew Kenney was releasing a new book, Everyday Raw Desserts. I finally got a chance to hop over to Amazon to check it out and was stoked to discover that I could take a peek inside the book. The table of contents alone got me drooling! 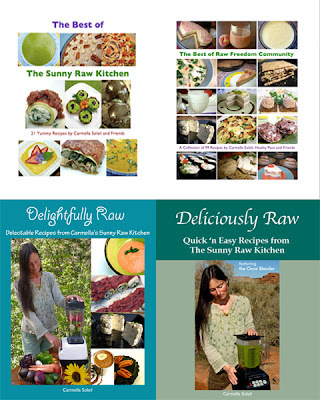 Everyday Raw Desserts has chapters on cookies and candy, brownies, bars and fudge, puddings, flans and custards, pies and tarts, cakes and cheesecakes, comfort food, ice cream and frozen treats, chocolate and finally raw dessert staples. Wow, this promises to join Sweet Gratitude and Heathy's Just Desserts on my shelf of 'raw dessert essentials'! One of the recipes that caught my attention was a Pear Frangipane; a French classic. I love love the rich flavor of almond extract so decided to make it for my first birthday feast. 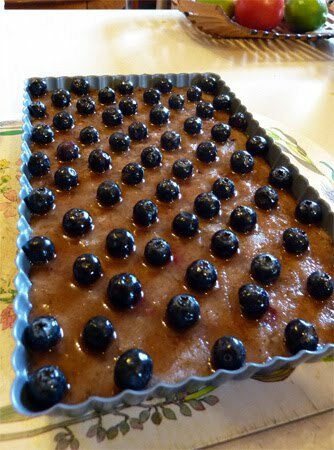 I didn't have any ripe pears on hand but that didn't deter me; I used blueberries instead. 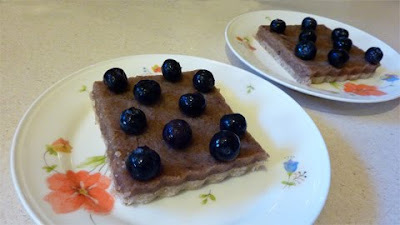 Traditional frangipane is a fragrant, moist filling flavored with nuts (usually almonds, but also sometimes hazelnuts or pistachios) and used in pies, tarts and cakes. It's usually egg-based, which puts it in the custard family, although its texture can vary greatly, ranging from a light pastry cream to a firm batter. 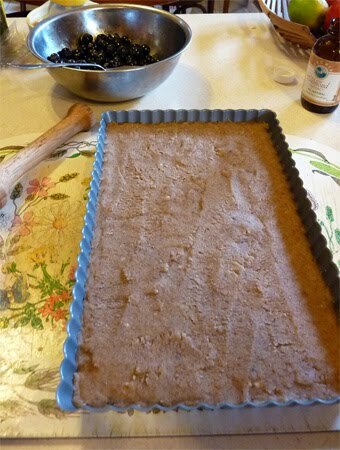 The raw rendition in Matthew's book is a combination of almond pulp (left over from making milk) and Irish moss paste. Let's pause here for a moment... Irish moss paste or gel consists of a mixture of Irish moss and water. However if you've come upon these in recipes before then you know that every chef has its own version of it, using a different ratio. There were no specifications in the Frangipane recipe as to how to make the paste. 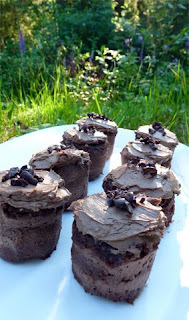 I'd stumbled upon another recipe to be featured in Matthew's upcoming book, the Triple Layer Chocolate cake on his site, which called for Irish moss paste but same deal, no specific directions. Hum, what to do? I decided to drop Matthew a line and inquire about the matter. Within hours I received a reply from Meredith who works with him and happens to be the actual recipe creator. She was so kind, walking me through the process and answering my questions. 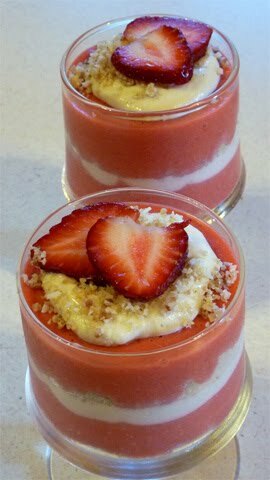 You guys will have to patiently wait for Everyday Raw Desserts to be released (hopefully next month!) before you can try this recipe at home, but I'm sharing the few mods I made anyways. For the crust, I used a mixture of cashew and coconut flours instead of just cashew, and then completely forgot to add the coconut oil. I don't think it was a big deal; it still held nicely. For the filling, I doubled the amount of almond extract, used vanilla powder instead of scraped beans (so much easier to work with! ), and agave only as I had no honey. I also cut down on the amount, using about 1/4 cup less sweetener. Oh, and I would recommend sifting the agave powder before adding it to the other ingredients as I had trouble getting rid of the lumps. Meredith sure was inspired for this one as the texture was awesome! 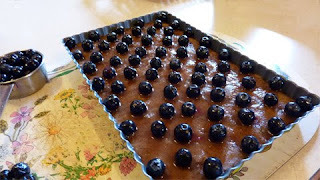 For the Fruit Topping, I used about 1 1/4 cups blueberries instead of the pear. I also skipped the dehydrator step, just tossing the berries in a little agave, lemon juice, liquid vanilla and salt. I then had fun creating a blueberry lattice. Lastly, instead of adding an agave glaze, I drizzled the left over liquid mixture on top. Afterward I wished I had thickened it up with some of the Irish moss paste; I remember using a similar technique in one of Sweet Gratitude's recipes. The glaze ended up being absorbed into the frangipane filling so it didn't look as pretty but boy, was it ever tasty! Heavenly! And so different in texture than anything I've tried before! Ahhhhhhh! What a feast we had ourselves! But the best part was that we were up for another one a few days later with our friends! Yay! In the meantime we ran out of dessert (now can't have that happen can I?) so I whipped up Cafe Gratitude's Strawberry Brilliance Pie which I served as parfaits. Not only was it a great way to use some of the extra Irish moss but it sorta fell in line with my birthday tradition (my mom would always make me strawberry shortcake). This is really to live for! In fact, a friend even told me that it was THE best dessert she EVER had! How about that!?! 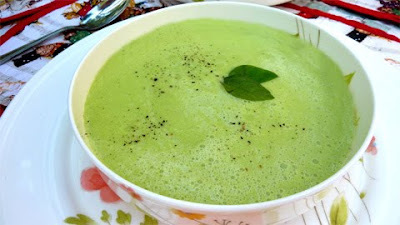 If you wish a warm soup, use hot water or heat it up gently on the stove on medium heat while stirring constantly. The main course was BBQ Skewers from Sarma's Living Raw Food. The recipe calls for Lapsang Souchong tea to give a slight smokey flavor to the veggies. This technique was also used for the delicious Portobello steaks we enjoyed at Matthew Kenney's restaurant in Florida. On Jozzie's recommendation I used half of the amount of tea called for which also helped reduce the level of caffeine - a bonus for me. The veggies were first marinated for a few hours, placed onto skewers (I just left them 'loose') and dehydrated on teflex sheets for 3 hours. I was amazed at how 'cooked' they looked! In her book Sarma serves the BBQ Skewers with a coleslaw. I didn't read the recipe properly and just went ahead and made the Dill Mayonnaise, thinking it was to accompany the veggies. When I realized that it was intended for the coleslaw I set it aside. I used it later for tomato and sprout sammies and it absolutely rocks! Really very good! And last but not least, we enjoyed the Triple Layer Chocolate Cake, also from Matthew Kenney's upcoming Everyday Raw Desserts. • ¼ C Irish Moss Paste* can be used with wet ingredients or ¼ C flax meal with the dry. This is optional and creates a fluffier mixture. To prepare Irish moss. Thoroughly rinse the seaweed to remove any sand or particles. Soak rinsed moss in cool water for 3-4 hours. You do not want to soak it too long because it will decrease its gelling potential. In the vita-mix blend the moss adding the water a little at a time, the moss varies in water content so you may need less or more depending. You want the paste to smooth and thick, not watery. Once the desired consistency is achieved add a few Tbsp agave and about a tsp lemon juice. This makes the perfect Irish moss paste for use in desserts. 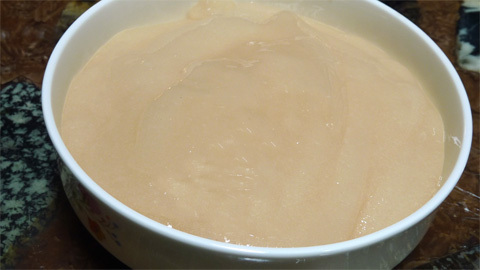 It will store in the refrigerator for up to 1 week. ~ I roughly chopped the Irish moss to make it easier to break down. ~ I halved the recipe at first but it wouldn't blend properly so I added an extra 1/2 cup of moss thinking there wasn't enough liquid in the blender. It still wouldn't blend. I kept adding water so that I could get the moss to 'explode' (as someone once described it) into a gelatinous mixture. In the end, it worked out to be 1 1/4 cup water to 1 1/2 cup moss (before chopping). When I told Meredith about my difficulties she said that it depends on the moss, as the gelatinous content can vary. Ahhhhhh, I'd never thought of that before but it makes sense! 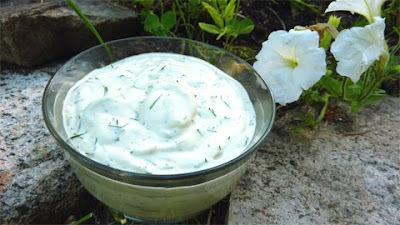 ~ I omitted the agave and lemon juice as I wanted a more neutral paste. I figured all I'd have to do is add a bit of these to the desserts instead. In a vita mix thoroughly blend all the wet ingredients except for the coconut oil until smooth. Then add the coconut oil and continue to blend until well combined. In a mixer or food processor mix the dry ingredients until thoroughly combined. Slowly add the wet ingredients. 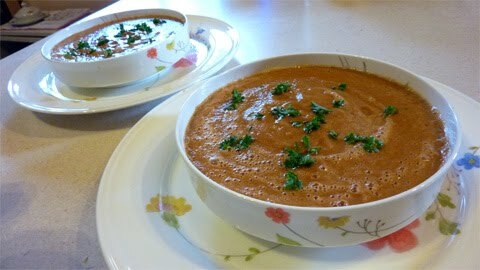 It is better to use a standing mixture as this will keep the mixture lighter and more fluffy, but if you do not have a standing mixer it can be done in the food processor if you lightly pulse the wet ingredients in. You do not want a dense heavily blended mixture. In a vita mix thoroughly blend all the wet ingredients except for the coconut oil until smooth. Then add the coconut oil and continue to blend until well combined and creamy. Place in the refrigerator for 30 min to an hour until slightly firm, but still able to be easily spread. Divide cake batter into thirds. Press one layer of batter in a 9 inch spring form pan and alternate with frosting. Refrigerate just before serving and glaze with Cacao shell. ~ I made only half the recipe as it seemed to be a huge cake. ~ I made the Cake Batter in my food processor. ~ For the Fudge Frosting, I totally read 'Cacao Butter' instead of 'Coconut Butter' since the Cake layer called for Coconut Oil. Anyhoo, I used Cacao Butter and it worked beautifully. ;-) Also, you know how whether the oil/butter is measured before or after melting makes quite a difference? Well in this case the amount before melting didn't feel right to me. I was concerned that the frosting wouldn't be firm enough so decided to go with 3/4 cup (well, actually half of that) of melted cacao butter. 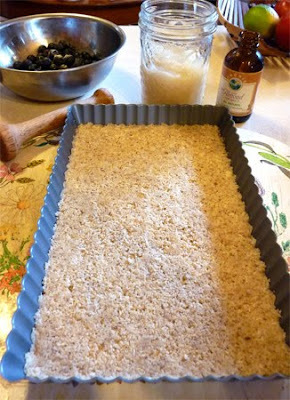 I also added 1 tbs lecithin, just to be safe. And thus ended an array of exquisite gourmet treats. Guess I'll just have to pretend that every day is 'special' from now so that I can keep experimenting, eh? ;-) I'm lovin' all that novelty! Wishing you all a very blessed and special day too! Great post, all of your posts are great. Keep shaing your gifts!! You are so talented. I have a question... when you make a raw cake and it calls for almond flour, are you using ground dry almonds or dehydrated almond pulp from making almond milk. 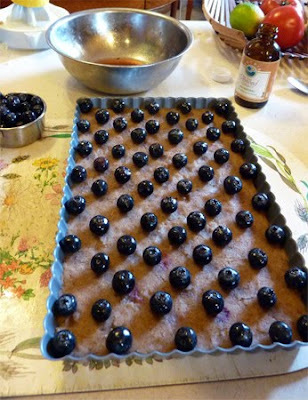 I am always confused when I read a raw cake recipe. Also, in Matthew Kenney'r recipe for the chocolate cake...what is Cacao Shell? I am thinking that it is cacao powder, coconut oil and maybe some sweetener...all which harden when drizzled over something cold like ice cream, etc... Loved your posts and your new pic is so beautiful! Thanks for your good wishes and kind words everyone! Lisa! How are you, girl!?! 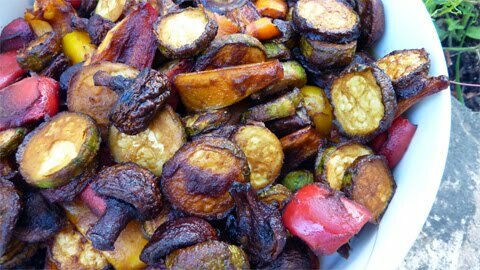 I prefer to use almond pulp rather than ground dried almonds as it makes for a much lighter batter. I don't bother dehydrating my pulp since most recipes call for some kind of liquid anyways. I figure what's the point then of going through that extra step? (I like simple!) By the way, in Cafe Gratitude's desserts, they also use wet almond pulp. As for the cacao shells in the Cake recipe, I just assumed she referred to cacao nibs but I think you're right; it's probably a mixture of cacao powder, coconut oil and agave. The book is coming out this month (fingers crossed) so I'll post the details once I find out how it's made.